I'm again again this week. I'll be working on unsourced Lloyd profiles. And thank you to all who participated last week. We hit the goal I had set for us of 10,000 profiles in 2017. I am so proud of our accomplishment! I'll help again if I find time. Got company this weekend. 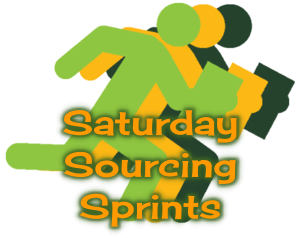 2017 is over and Sprinters added sources of some kind to 10,553 profiles during the Saturday Sourcing Sprints. Through the course of the year, we had 91 registered participants and countless others who used the tracker but chose not to register. Not surprisingly, John Noel finished with the highest count at 1,938. I think he would agree, though, that we are all winners because our WikiTree is stronger through our efforts. Whether you did one, one-hundred-and-one, or more, each of your contributions is what has helped make the Sprints so effective. Thank you! A late start, but I'm in. Every little bit helps, Beverly, so a late start is still a good finish. Thanks for joining us! Congratulations, Beverly, on winning the final Saturday Sourcing Sprint of 2017. I try to source one or two random profiles a day, so I’ll participate. Lately I’ve been trying to improve profiles with no birth place and/or no birth date. Good job Kay and welcome back! I've been working on Orphanded Profiles. I like to work on profiles that haven't been touched in a while but which have an active manager, in the hopes that it will encourage folks to cite sources. OK, count me in - altho I tend to update profiles right after I create them because I'm using different pages of my source documents. Welcome to the Sprints, Roy. Like you, I source no matter whether there is a challenge or not. During a challenge, I’m more likely to work on orphaned profile though. That’s why I like the Sprints; it gives me a chance to play in records and locations that aren’t my usual go to records. so when it starts after every referenced good source I add too a profile I hit challenge tracker, then what? Welcome to the Sprints, Troy. You only have to go to the tracker for the first source you put on. You’re welcome to add more but it doesn’t increase your Sprint total. If those didn’t answer your question, give me a little more detail and I’ll give it another go. I am in again for Team Tennessee I am their leader. Good to see you back again, Linda. Great, Michelle, glad to have you back. Did more than I thought - and I ended up in a tangled messy branch of the tree and had to sort that out - a man marrying his mother and being the father of his siblings and I don't know what else..but I think I've sorted it and sourced most of them in the process! Sounds like a case of "I am my own grandpa" LOL Thanks for getting them sorted and sourced! Sorry I flagged you accidentally Debi! It's getting late here, so my job for the coming week is to go back to those profiles and add all the census details I found. It's one of those families which is confused by cousins with the same names born in the same place - so glad the GRO online indexes give mother's maiden name! Slowly but surely, I've been cleaning up unsourced New Hampshire and a few from Massachusetts. Count me in -- but I wish I had more time this weekend, so I can do more. Janine, every one that you do makes our tree stronger. Thank you for joining us this weekend. Hi Debi, thanks for your message on my page the other week, I've finally remembered to register, I've added some sources today and yesterday on the challenge tracker and I'm participating as part of team GB-gen. Will I need to re-register every week? Welcome to the Sprints, Lizzie, and thanks for registering. You only need to come back and add an answer each week if you want a chance to win the weekly Sprint badge. Some people aren't motivated by badges or have already won a week so they either don't register or just comment on the first post. Welcome aboard, Linda, and enjoy the Sprints. Let me know if you have questions.